When I walked out of my local cinema having seen Zodiac in 2007, several people walked past me muttering sentiments such as; 'man, that was long', 'so, who was it?' and 'that ending was rubbish'. In the three years hence, David Fincher's film has never quite escaped these criticisms. It is arse-achingly and deceptively long (one-hundred and fifty seven minutes), especially for its genre. It is disturbingly ambiguous, suggesting a favoured suspect but refusing to rule out several more. It ends, not with an arrest but with a meeting in a hardware store and a look at a couple of mug shots. It is also an arresting, beautifully sculptured piece of cinema which does far more than speculate on the identity of a serial killer. It is basically, brilliant. The problem that Zodiac suffered at the time was that it was marketed as a serial killer film, understandable given its director's previous foray into the genre with Seven and his exploration of the unknown antagonist in The Game as well as the fact that it is based on Robert Graysmith's non-fiction book of the same name. It is however, much more than that. Zodiac is an expose of what happens around a serial killer, a look into how the magnanimous events effect the periphery. The periphery in this case includes reporters (Jake Gyllenhaal, Robert Downey Jr.), cops (Mark Ruffalo, Anthony Edwards, Elias Koteas), 'experts' (Brian Cox, Philip Baker Hall) and families (Chloë Sevigny, June Raphael), and all are meticulously created and examined, catapulting the film into being as a social ensemble drama which just happens to run parallel to an ongoing murder investigation. The tagline, 'there's more than one way to lose your life to a killer' more than hints at Fincher's main aims. In most ensemble films there are hits and misses, areas of greater and lesser focus. The same is true here but in expert hands, the negative points are incredibly few. Out of necessity, Gyllenhaal's Graysmith is the focal point about which everything moves, but the actor isn't tested by a role which requires little and is, in the end, fairly one-dimensional. June Raphael, playing head investigator Dave Toschi's (Ruffalo) wife is a fascinating character, completely loyal and understanding but entirely marginalised, again, out of necessity. The high points though, soar. 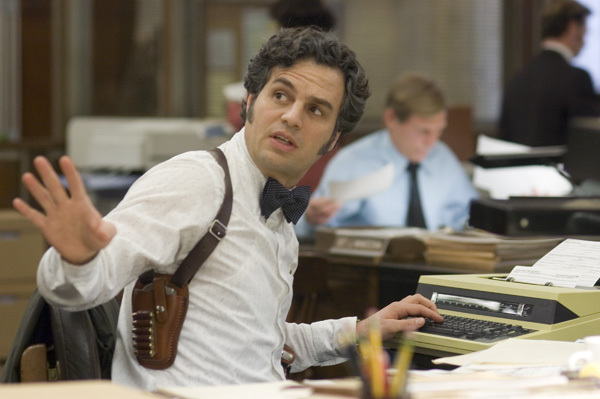 Ruffalo is the stand out as Toschi; career best, embodying the role, dynamic - all the superlatives apply. Opposite him for the middle third of the film Anthony Edwards is the perfect foil, deadpan to Toschi's humour and overt emotion. A little used, growling, Dermot Mulroney is great as the pair's captain whilst Koteas again sneaks in to a wonderful bit-part as compatriot Donal Logue nicely rounds out the police complement. It's a thrill to watch the backwards interaction between the characters, police or not, in a script that, whilst dialogue heavy, is hardly without a moment of import or, at the least, interest. Of course, around all of this, there is the serial killer who Fincher can't, and doesn't ignore. Gyllenhaal's basement encounter with a suspect is the type of scene to inspire jealousy in any respectable horror, a lakeside killing is brutal and shocking in the daylight, the everyday happenstance of the opening and second-to-last scenes, chilling. In a film with so much character and factual reveal, Fincher remembers his thrills and chills. An always watchable, leave-no-stone-unturned drama, from a director who has few equals. And we haven't even mentioned Robert Downey Jr.
Hugo Stiglitz Makes Movies crafted a pretty good argument for this being the best film of 2007 claiming, 'Zodiac is a dark and nihilistic film that offers no simple resolution, answers, or reason for death. It excels on a frustrating and ambiguous narrative idea: not knowing who the Zodiac killer is, and never being able to find out. Or rather the broader, more overarching, theme that death is not only prevalent, but also constant, nonnegotiable, and impervious to our desire to understand'. Candice - I think that's a good point. I can't remember it getting any attention really but I have had similar conversations about its lack of Oscars recently. Fincher will get one eventually. MovieNut - Cool! Thanks a lot! I haven't seen this film yet but will make a point of it now. Cheers for commenting Ric. Yes, definitely grab it as soon as you can. I would say the same for anything by Fincher that you haven't seen. Apart from his Alien film, there's nothing there that isn't pretty damn close to brilliant. I've always felt the movie's greatest weakness is the real events. There's tons of websites that are dedicated to the analyzing the Zodiac killer, and possible suspects. Breakdowns, profiles, etc. It's insane. Not much Fincher and company could do with it, but they handled it marvelously. This was one of the very few DVDs I went out and purchased the week it came out. Love this movie so. At first, I thought it'd be a disposable go-get-em serial killer flick, but it was so f(uc)reaking amazing thing. That is all. Uni - that's an interesting point but I would perhaps argue that although there is a wealth of stuff out there, the general public's knowledge perhaps isn't so advanced? A good point to say there's not much Fincher could do with them though - they had to be there in one form or another. Simon - I agree. Loved it first time and it has only grown on me since.